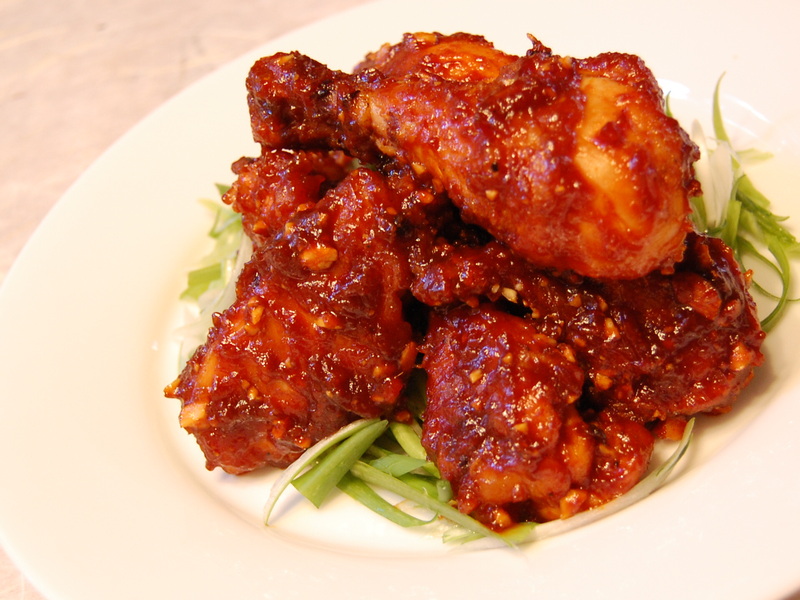 It seems that the growing popularity of Korean chicken in recent years has amounted to a “cult of crunchy, spicy, perfectly nongreasy chicken” which is only getting bigger with the quest for perfect Korean chicken recipes. The fairly new, endearing term of ‘the other KFC’ referring to ‘Korean Fried Chicken,’ recipes featured on various sites, from David Lebovitz to more recently in Saveur and Serious Eats, or more of a kitchen lab experiment done by ZenKimchi are all pretty amazing to me who grew up eating a version of this KFC at home without putting much thought into it. To offload some self-imposed pressure I feel as a Korean person offering another fried chicken recipe, I’d like to start with a disclaimer. This is not one of the popular Korean fried chicken chain recipe secrets. This is an updated version of what my mom used to whip up in a few minutes – lightly pan-frying chicken drumsticks then coating in the sauce of gochujang (고추장, Korean hot pepper paste), ketchup (yes, ketchup!) and corn syrup. Simple. Quick. Delicious. My sister and I devoured them every time. This pan-fried chicken recipe is also a friendlier version for home cooks, especially for those like me who live in shoebox apartments that hold deep-frying smell for days. You can just use drumsticks or wings, but since we’re trying to make the most out of buying a whole chicken, we’ll make use of what we have now in this post. Sift to mix completely. You can also just use any starch powder alone. If frozen, defrost the chicken legs, thighs and wings slowly in the refrigerator overnight. Cut off the top of the wings and discard. Cut each thigh into 2-3 pieces, so you have 8-10 pieces total (2 legs, 2 wings and 4-6 pieces from thighs). Pat dry with paper towel, then rub each piece with fresh grated ginger and its juice. Season with salt and pepper and let them rest for 30 minutes to an hour. Coat the chicken pieces in the sauce and mix well. Now it’s ready as banchan (반찬; side dish accompanying rice) or as anju (안주; side dish accompanying alcoholic beverages) with beer or soju! Time to take out a container of chicken stock (4 cups) and a bag of chicken breast meat from the freezer and move them to the refrigerator – we’ll be making some chilled chicken soup appropriate for the summer! That is some nice looking KFC!